Bonus Activity: It is time to get creative! For this bonus activity you are asked to design a simple logo for the next Summer Olympic Games. 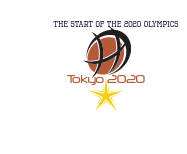 They will be held in Tokyo, Japan in 2020. The Olympic committee in Japan has already created four possible options for the logo (see below) but I think that you can create something even more interesting and attractive! To create a logo I would suggest that you use the Design Mantic website. Click on the Design Mantic link. It will bring you to the homepage for the site. Enter ‘Tokyo 2020’ into the ‘Company Name’ box and select ‘Sport & Fitness’ from the drop down menu in the ‘Industry’ box. From there you can create your own logo. When your logo is finished, copy and paste it onto your blog along with a short explanation of your design. This is the logo I designed using Design Mantic. The star represents winners. Everyone who competes in the OIympics are all winners. The logo in the middle represents all events. Events that involve balls and events like, track and field.